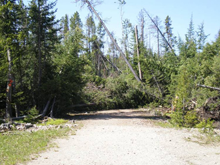 Timber blowdown in the Beaverhead-Deerlodge National Forest on July 13, 2009. Timber blowdown is a term that denotes wind damage in forests due to winds felling trees. Although any tree can be blown down by high winds, trees that are near the edges of stands are especially vulnerable. And among those most vulnerable are those near new edges — edges that postdate any severe windstorms and which result from road cuts, skid cuts, thinning, cutting, fire, or recent natural events such as disease, floods, landslides, avalanches, or other similar events. Trees near new edges are more vulnerable because their species might be inappropriate to edge life, or they might have directional wind firmness inappropriate to the new edge. In other words, the individual tree might be making an assumption about what it needs to thrive where it is, but the recent formation of an edge renders that assumption invalid. Analogous issues can arise for us at work. We might make assumptions in the form of presuppositions of type 1 that are innocent enough, but changes in the organizational context can render those presuppositions inconsistent with career security. And uncovering those problematic presuppositions can be difficult indeed. This is one of the uncertainties of organizational life that makes many of us justifiably uncomfortable about organizational change. Photo courtesy U.S. Department of Agriculture. Some people use presuppositions to coerce others into accepting responsibilities they don't want or can't fulfill. Here's an example: "Jesse, when can you have this done?" It sounds like an innocent question, and often, it is. But suppose Jesse hasn't yet committed to the task because he's overloaded, as he had politely explained yesterday. And suppose further that the question is asked in a meeting, with colleagues and perhaps Jesse's supervisor looking on (or listening in). Jesse would be cornered. He would have to choose between acquiescence and contradicting the speaker, and thereby seeming uncooperative. Worse, if he contradicts the speaker, however politely, the speaker might respond with something like, "Whoa, pal, you already committed to doing this. Are you reneging now at this late date?" Some operators might do this even if Jesse had never said or done anything resembling accepting responsibility. Presuppositions aren't inherently evil. A presupposition can be appropriate when all parties to the exchange are aware of the assumption and agree to it. I call this a Type 1 Presupposition (PS1). But when the recipient of the message is unaware of the presupposition or doesn't agree with it, trouble like Jesse's begins. If the presupposition is inadvertent it's of Type 2 (PS2). If it's intentional, it's Type 3 (PS3). Here's what you can do about Type 3 presuppositions. Ending the use of PS3s begins with learning what they are. Outside the context of any PS3 incident, explain PS3s to others. The word presupposition is familiar to some, but many don't really know what it means. to coerce subordinatesform of psychological abuse. We must recognize as abusers any managers who use presuppositions to coerce subordinates. Targets of PS2s and PS3s are vulnerable. Responding safely is difficult. But third party bystanders can respond constructively and forcefully by simply identifying the presupposition. Example: "Wait a minute, I didn't realize Jesse had committed to this task. I'm concerned that he might become overloaded." Would you like to see your comments posted here? rbrenyPpmHfbrlXwxTROcner@ChachLWxEMZsOrbkmFSRoCanyon.comSend me your comments by email, or by Web form. I offer email and telephone coaching at both corporate and individual rates. Contact Rick for details at rbrensxbVeWLjTjSjyMLzner@ChacvbDkoCrTgBaOGkfjoCanyon.com or (650) 787-6475, or toll-free in the continental US at (866) 378-5470.